Alright, alright, alright. I know the picture above does not look that appetising, but trust me, taste wise it is pretty creamy and sweet with a zest of citrus from the strawberries (which you are unable to see in this picture) and raspberries. Honestly, I never really understand why the strawberries we have in Singapore are never sweet. Or is it just me? I always seem to be buying strawberries that are sour no matter how ripe they are. Their bright red appearance are so deceiving! Anyway, Wednesday is usually my busy busy day with all the household chores to be done as well as lessons to prepare and to go to. So, just last Wednesday, I woke up in the morning with this feeling of wanting to fill myself up (with some good food, of course) for a busy day ahead. So, what I saw in the fridge were tonnes of fruits which I have bought over the weekend. 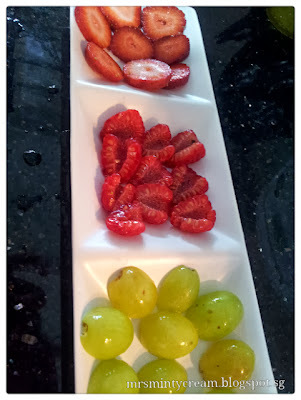 So I thought, why not have a fruity morning! 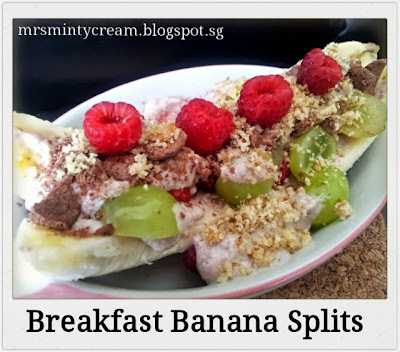 The idea of Breakfast Banana Splits just came to me. For those of you who know me, you will know that I am not so much of a citrus fan and that my tolerance level for sourness is really really low. Luckily, I found some grapes in my huge fruits collection in the fridge and of course I added them to the berries for my Breakfast Banana Splits. At the same time, I also wanted something a little crunchy and chocolatey and hence, I pulled out the last box of Koko Krunch cereal in the cupboard to go with the dish. 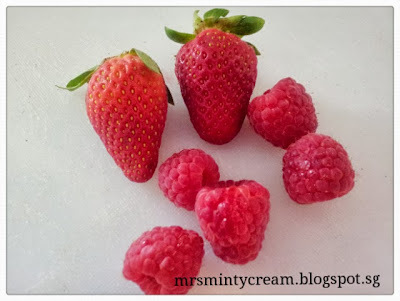 If you are looking for something healthy yet yummy and at the same time, you are a huge fruits fan, try this recipe. 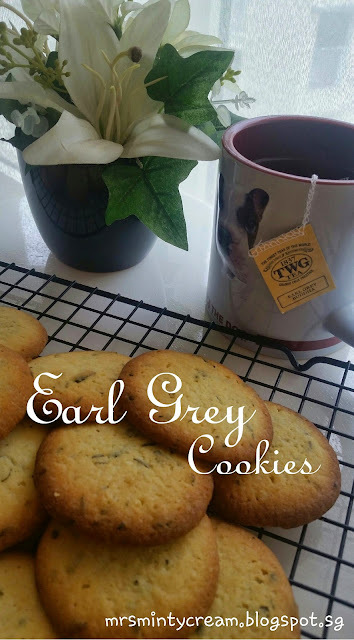 Simple and easy to make and you are good to go in a couple of minutes. Have fun! 1. Slice the bananas in half (lengthwise) and place them separately in 2 serving dish. 2. 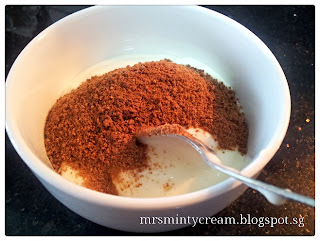 Mix 3/4 of the Koko Crunch Cereal with the plain yogurt. 3. Spread half of the portion of yogurt mixture along the (top) length of the banana. 4. Place the berries and grapes on the banana slices. 5. Spread the remaining yogurt on top of the fruits. 6. Sprinkle with chopped walnut and remaining 1/4 of the Koko Crunch Cereal on top.